Peter Firestien (1869-1937) and Sophia (Yost) Firestien (1873-1929) (pictured below) and their sons, Conrad (1895-1976) and Louis (1898-1966), immigrated to Colorado as part of the group known as the "Germans from Russia" in 1899. The 1900 census placed them in Globeville, Colorado, a north-central Denver settlement that many Germans from Russia called home when first arriving in the U.S.
Obituary records placed them in Eaton, Colorado, around 1903 and in the Windsor and Bracewell area as early as 1911. A 1917 Greeley City and Rural Directory confirmed they were living on the property currently known as the Von Trotha-Firestien Farm. The Germans from Russia were known for their work in the sugar beet fields and it is quite possible the sugar beet boom brought the family to the area. A wood frame house once stood to the west of the current stucco farmhouse and this is where Peter and Sophia lived and raised their six children; Conrad and Louis, who were born in Russia, and George, Henry, John and Mary who were born in the U.S.
Peter and his sons all farmed for Bode and Claude, the Von Trotha Brothers. Photo of newly completed stucco house with wood frame house still standing to the west of the current farmhouse. Photo courtesy of Terry Herbst. There are two different stories as to who the stucco house was built for. One story is that it was built for the Von Trotha Brothers and which ever brother decided to marry first, would live in the house. The other story is that the house was built for Conrad “Coonie” Firestien. Coonie did live in the house from the beginning with his wife, Mabel, and their family. Conrad and Mabel were married on the farm and had six children who all grew up on the "home place". Their children were Wallace, Wynona, Wilbert "Chuck", David, Shirley and Gerald. All of the children were born in the stucco farm house except for the youngest, Gerald, and the oldest, Wallace. 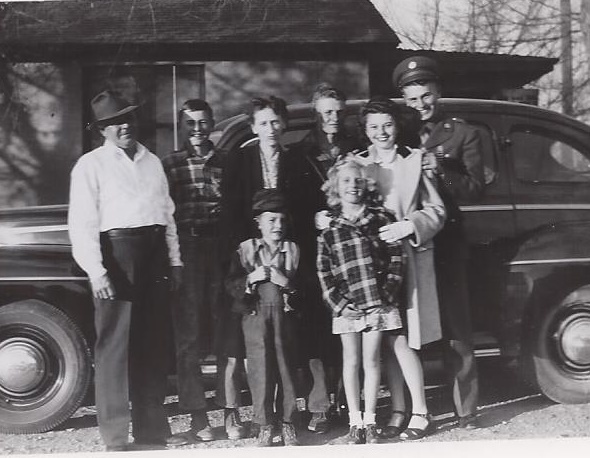 Conrad Firestien Family, 1940s Pictured, from left to right, are Conrad “Coonie”, David, Mabel, Wilbert “Chuck”, Wynona and Wallace “Wally”. In front are Gerald and Shirley.